Hauled from bed as the sun itself is starting to stir; tracksuit bottoms fumbled for; cup of tea left half full. No time, need to go. Earlier in the year it seemed strange to use bike lights at the break of day. But now the birds have remembered their air calligraphy; they are trialling Spring melodies. The wind is cold but the damp is running out of steam. It is 7am. I am preparing for Tai Chi. Body: remembering the warmth of duvet and down. Mind: counting the moves to the front door in a series of gestures: tea cup down, puffa jacket on. The sleepy maiden fumbles for her keys. In the room – a warm and curtained modern Cambridge lecture theatre – we stretch and jiggle, bend, occasionally giggle. We prepare for the ‘short form’ a series of positions which look like balletic templates for martial combat. The moves glide from one to the next. This is where memory comes in. The class is quite small, it has the feeling of an exploration, a garden. Something is growing. Awareness. Calm. 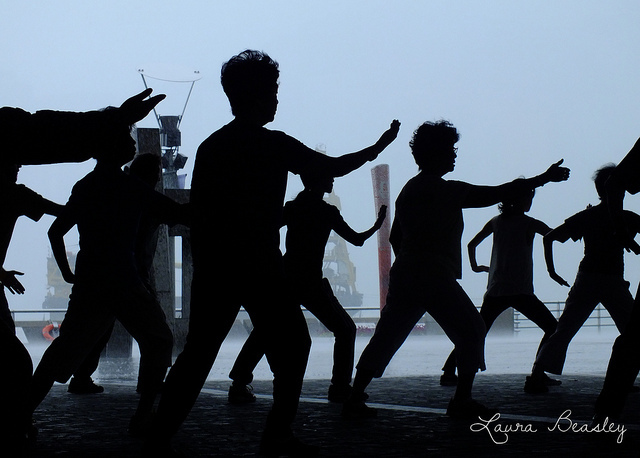 Tai Chi is gentle but deep in its application. To those who have seen it in presentations or TV films it may appear flowing, rhythmical, elegant even. I would rank it along with meditation, learning and focused development as something which can positively affect the way we interact with the world. It is acting on our deepest sense of balance, self and centre. It is astonishing how moving the form, the flesh, our limbs, can change the way we feel inside. Those who know yoga may concur. There is a kind of submission in asking the body to do what it has not known before. I have to admit that my mind spends little time outside our Saturday morning sessions memorising the positions. Yet strangely, miraculously the body remembers. Our teacher tells us that Tai Chi is all about circles. She refers to the celestial bodies and their orbits, she tells us that while our feet are anchored to the ground, the tops of our heads are stretching towards the heavens. By gyrating one foot she shows us what happens when a circle has a centre. It can become wider and wider and wider and wider. I think of the direct hit of a pebble on a lake. I think of the ripples. I am reminded of what can be achieved when the intention is firm and focused. During the warm-down – which everybody seems to love – we gently tap at parts of our backs, our knees. We are accessing pressure points, allowing the energy (Chi) to return to its course. As we leave the building for another week, we cross some of Cambridge’s oldest pavings. Pointed arches refer to other lands, the height of the doorways, to scholars with different postures to our own. The whole day stretches ahead like a gift which I have the mind-space to enjoy. Serious. But still. He’s funny. A comic who is even more hilarious when he’s serious. This is one of numerous paradoxes from a performance brimming with thought and observation. Usman is in Cambridge, at the brand new divinity building; a formal and fitting venue to mark the end of his tour of four stand-up evenings, dedicated to raising money for the new Cambridge mosque. He greets the audience. The audience murmurs. He laughs and berates us. University students and new mosque fans titter nervously. And it does. Until Cambridge relaxes and Azhar Usman starts to showcase some of his new, more philosophical ideas. 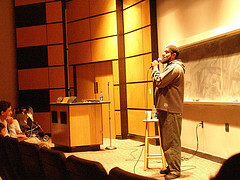 Over the past five days he has performed at SOAS in London; twice at the Drum in Birmingham, the New Bradford Playhouse and finally in the Cambridge University divinity building where the paint is still drying and the oak doors and state of the art fittings remind us that, while what is studied between its walls may be ancient in origin, the beauty of good architecture is timeless. Comedy loves a bit of angst. The Will the audience fall off their seats or run out the room level of tension reaps humorous reward. Of the three shows I watched, this one definitely has the edge. He says that he loves to observe people. He likes it that we all ‘do dumb things’ sometimes, but he himself is far from foolish. This comedian has entered the realm of the great stand-ups whom he so clearly admires. He has found the formula, which is another paradox. Speaking his truth in a loud, Chicago accent, the fact that it is his, unique observation, is what makes it universal. We laugh because we recognise our own humanity in his. At each show, Usman asks, ‘How many Muslims we got in the audience tonight?’ and the clapping is substantial. ‘And how many non-Muslims we got here tonight?’ There is a smattering of applause. I sense he is putting up litmus paper, measuring his jokes, trying to see how far in which direction to take us. He is a link in the broken chain of a fragmented world which has only the media to convey an image of each part. He is aware of his role, mocking our prideful egos, using the example of our unwillingness to back down from disagreement in hilarious parody. ‘You gotta fight fire with fire!’ he relays a ridiculous argument with a friend, finding zero instances of when that statement could be true. The set piece ends with the friend maintaining stubbornly, ‘But still,’ and our comic is bemused. Still, great art connects. It destroys the myths of the powerful and subverts their stories. It joins us with our shared history and heritage, connects individuals with our feelings, artist with viewer and each audience member with the person, of whichever background, sitting next to them. So it is fitting that such a creative charity tour should be supporting the building of another piece of art. A place which wants to connect neighbour with neighbour, believer with believer, and all of us in our shared history of buildings which change the fabric of our daily lives. How generous that a person should travel so far from home to help make this happen. I had never been in a court of law. In an oak-panelled room, sunlight cast shadows across a large table of ten seated figures with a woman in a dark suit at the helm. Her resonant voice reached her spectators with ease. In the audience were smartly-dressed men, some bearded, some in small cloth hats, a group of brightly-scarved women and a mother with a pushchair; her baby son informing us rather loudly that he’d rather be elsewhere. This was not exactly a court of law but the protocol was sombre and precise. We were in Cambridge’s Guildhall and the council was about to make a decision about a new building. The room hushed to the hum of the baby’s burbles and the councillor began to speak. Projected behind him was a huge image of the proposed building; a low-standing edifice in perfect proportion. Flanked by cypress trees, its shape and lines glided in inspired harmony with the surroundings. The contours of its honeyed walls melted into the flowing gardens. Punctuating the azure sky, a golden dome crowned the roof, pointing to the heavens as if to say, This building was envisaged by people but its beauty hails from beyond this Earth. 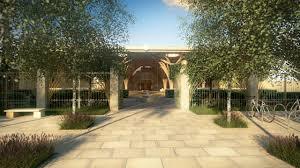 The councillor was showing us a design for Cambridge’s first purpose-built – and Europe’s first – eco-mosque. Look a little closer, however, look beyond the surface of its gilded dome, and there is much more shining from beneath. Its planned site, Mill Road, is not known for the width of its tarmac. A friend of mine once likened cycling there to playing a computer game; one point for each pushchair, pedestrian changing their mind, car nosing from a side-street, you manage to avoid. Anyone who has tried to turn off from Mill Road, towards the railway station at certain times of day, will have noticed the overflow from the local Muslim prayer points. So ample space where Muslims can worship has long been overdue. But Romsey mosque was to be more than a Muslim prayer space. Let us return to the Council’s ‘court room’, to the man standing by the projector, the audience’s eyes fixed on the elevated design, waiting to hear his findings. In his formal way, the councillor listed the points in the project’s favour. 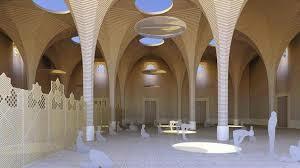 The new mosque would be, according to his – and it later transpired, his colleagues’ – view, remarkably beautiful. A Marks Barfield building, (designers of the London Eye) it would draw many visitors. Oft-visited Cambridge, of course, already has stunning architecture, but as most Mill-Roaders will agree, Romsey town, despite its cute Victorian streets, needs a little shine. He mentioned the community – not the sizeable Muslim populace, who will clearly gain from this development, but others in the local area who will use the formal gardens, the seating space – outdoor and indoor – the airy rooms for hire, the café and of course the chance for a local, intercultural, real, social space. Until two years ago, I had never walked into a mosque. The media had made me wary but more than that, I didn’t know I was invited. I was curious about what I might see. The design of this jewel of a building makes it clear: Cambridge new mosque wants to fling open its gates to you. Its tree-like arms are open for visitors, its sacred spaces ready for your gaze. Towards the end of the meeting, the woman with the child stood up. She lived on one of the adjoining roads and was concerned about noise and possible parking problems. She was questioning what would happen with the noise around festive moments such as Eid, or popular prayer times. Her worries were heard and then defended by the councillor, with reference to the detailed designs. When we chatted outside the meeting room afterwards, the woman from Romsey was keen to make a point. And in this way, the conversation had begun. The Muslim, the non-muslim, the mother, the single person, the councillor, the award-winning architect. All of us need a space to share, to support and learn about the other. Would we be given the chance to do this in what Councillor Hipkin predicted could become ‘A major acquisition to the treasure-house of architecture that is Cambridge’ ? As the meeting closed, the councillor declared that planning for the building of the new mosque on Mill Road had been approved. I realised that a new chapter had finally opened in my city. As the defender of the mosque project had aptly stated to the council, here was a case of ‘Two birds with one stone.’ While embracing the Cambridge – indeed British – spirit of opportunity in diversity, the new building would encourage what Muslims value so highly. The opportunity to know one another.